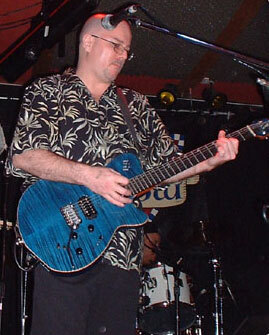 George is a multi-talented musician and songwriter and has many years of experience as a performer. Below is a sampling of original instrumental songs in which he plays guitar, bass, drum programming, and keyboards. All files are in MP3 format. ABOVE: George playing live with Deborah Bishop. Their album, "Just My Alibi", won the 2004 Unanimous Choice Recipient award for Independent Americana Album of the Year from LA Music Awards.